The Chiefs beat the defending Super Bowl Champion Denver Broncos on a 34-yard field goal from Cairo Santos with no time left in overtime to pull off the 30-27 win. The Chiefs moved to 8-3, still one game behind the 9-2 Oakland Raiders and now one ahead of the 7-4 Broncos in the AFC West. 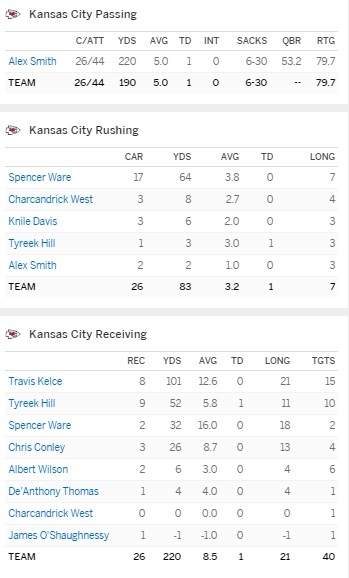 Chiefs rookie Tyreek Hill was the offensive hero, scoring three times, three different ways. Hill scored on an 86-yard kickoff return, a three-yard run and a three-yard pass for the touchdown that, with the two-point conversion, put the game into overtime. Hill is the first player to score those three ways in a game since Gale Sayers of the Chicago Bears did so against the Minnesota Vikings in 1965. Hill’s three-yard run put the Chiefs up 16-10, but the defense allowed two scores, including a 76-yard touchdown pass from Trevor Siemian to Emmauel Sanders. With under three minutes to play, Alex Smith engineered a 13-play drive that ended with the TD pass to Hill. When the Chiefs lost Jeremy Maclin earlier in the month, there were questions about whether or not someone could step in and become that play maker. Hill was obviously drafted because of his special teams ability, but Hill has stepped up on the offensive side of the ball. Head coach Andy Reid even eluded to it following the loss the week before when asked about the injuries to so many starters. Reid said this was a league of opportunity and he expected the next guy in line to step up and make the most of his chances. Hill has certainly done that in his first season. Hill leads the Chiefs with seven touchdowns and led the team with nine catches. Watch Hill high-five De’Anthony Thomas on his way to the end zone.